To be honest I wasn't sure what to make of this album when I picked it up and looked at the cover. There was Mary herself draped over a purple armchair, dressed for a party, with what looks to be party streamers and confetti for decoration but I was intrigued by the guitar propped up next to her and the banjo in her lap. 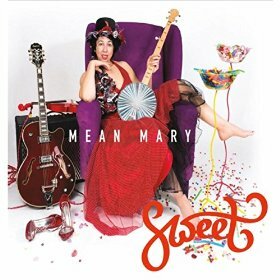 I had heard of 'Mean Mary' before and knew her to be talented but knew very little else about her. I was intrigued enough to give it a play and perhaps pick out a couple of tracks for radio play but certainly never intended reviewing it. Just one play of this extraordinary album was all it took to get me to change my mind. Already I'm thinking in terms of one of my albums of the year and at the same time cursing the fact that I played the album in the first place due to its now long residency in my home c.d player! Despite having read up on her she is still a difficult artist to describe. I usually try to give at least some brief biographical detail on artists but Mary James (her 'real' name) has had such a full and fascinating life that she is impossible to describe without writing a book so I'll try to keep to her working career rather than her background that led her to music. She is a published novelist, a virtuosic guitar, banjo and fiddle player, possesses beautiful and highly individual vocal pipes, a talented songwriter who has made several albums of 'old timey' music with her brother Frank and is currently in the midst of a successful solo career as well as having been in Europe (including Britain!) on tour through April and May to promote this, her third by my reckoning, solo album. She has her own T.V show in Nashville and I'm pretty sure there's more but without referring to her website bio I can't think what else there was, apart from the fact she has also won numerous awards! Look it up yourself or I'll never get around to having a go at describing this album! This album includes just about everything any listener could wish for from beautiful (and sometimes quirky) vocals, incredibly virtuosic playing (apparently Mary plays eleven different instruments), diverse tempo's, subject matter and styles, fourteen great songs that clock in at the better part of an hour and hugely entertaining! As I said; everything you could wish for and yet, and this is what I love even more about it, those diverse sounds and songs all fall within her natural and heartfelt country/folk boundaries, very wide boundaries for sure, but boundaries none the less! The breadth, scope and sheer expertise that has gone into the making of the whole album is often quite astounding as is the variety proving that huge diversity is possible even without ever straying out of the, admittedly wide ranging, 'roots' music boundaries. Things get underway with a plinking banjo on Sunshine, the albums opening song, before bass, percussion and what sounds very much like a string section comes in. I felt the strings were a little superfluous and am always concerned when I hear them on a 'country' album but was rewarded for sticking with what is actually a beautiful ballad that led on to even greater things. Her vocals had a 'contemporary country' feel but much more diversity was soon to follow! Trumbull county antique tractor show is a quirky but tremendous country song that is placed in a rural setting, with some virtuosic banjo playing, hard driving bass and percussive clicking, with a vocal from Mary that perfectly evokes the songs setting giving it an old timey feel in a similar vein to Michelle Shocked's 'Arkansas Traveler.' Further warmth is added by the fiddle that also emphasizes the rural atmosphere. The excellent title track, Sweet, is propelled by some more terrific banjo picking and a quite original arrangement of the instruments on a composition that sometimes has the feel of a song such as Wimoweh, at others Joni Mitchells Big Yellow Taxi but always with Mary's unique originality. Perhaps it is the beautiful quiver in her voice or the harmonies that engender those comparisons but it is a song that will probably have huge appeal for most who hear it. That is followed by the stunning Voice from a dream an incredibly haunting, slightly mournful, violin driven instrumental that leaves a strong impression on the listener. Next up is a huge contrast in Methinks I see Jane with the plinking banjo and Mary's 'warbling' vocal, although the warble is never over done and the impression that is left is one of a beautiful vocal sound. The excellent Bad ol' John is driven by some lovely old timey banjo, acoustic guitar, thudding bass and percussion on a song that captures the slightly threatening 'old timey' atmosphere and creates a modern update of the genre, which through the development of music and recordings over the last ninety years led to modern day 'country music,' fortunately this is not the sanitized version. I often say that this or that artist should be a household name but in the case of Mean Mary I genuinely cannot believe she is not known in every household worldwide! She has everything and more that is needed to attain huge worldwide success and this album is another that will be vying for my 'Album of the Year.' It really is that good and has quite literally something for everyone. Now go online and treat yourself to a copy of this tremendous album by a uniquely gifted artist!